Thanks to the Star Advertiser and Erika Engle for a great article about our restaurant. 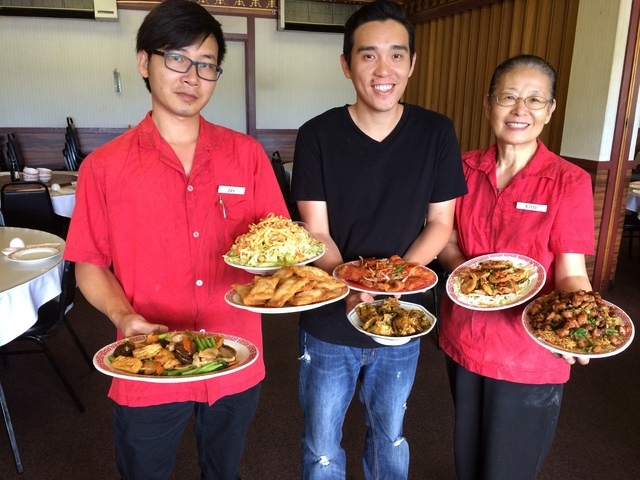 Read “Satisfy cravings for Chinese food at Kaneohe spot” featured in the September 7, 2016 edition. Jay, Jimmy, and Kitty. From the Star Advertiser 9/7/16. 1–1 order can feed how many people? Or if I gave you the number of people, you will appropriately fill the order? Would it be less expensive if I ordered by the trays? 2–What’s the difference between s/s spare ribs and pot roast spare ribs. Is the pot roast spare ribs softer? 3–Shrimp canton–is this the tempura style shrimp? How much per shrimp? 4–Is the combination chicken/char sui fried rice better than the chicken fried rice? 5–Choy sum–is this the soft vegetable? Softer than broccoli? 6–Long egg noodles–is this equal to udon? 7–Crispy fried chicken–is this like the Kentucky Fried Chicken? 8–When I place the order, who should I ask for? When I called in earlier, a lady answered who seemed rather impatient! What time should I call in? Tom, sorry about the call but it is probably best to discuss to get your questions answered. Mid-afternoon would be a good time to call and see if Joy, Lisa, or Jimmy can help you out.